The Google+ helps you to get influencers to share your content that'll generate more social media traffic from Google plus. There are several platforms available where you can market your blog post. You get massive opportunities to promote your blog and drive traffic to it. To drive traffic to website there are several social sites where you can promote your blog. But, with lots of options available, it is ideal to choose the most trusted and world-accepted social platform. You have so many options for promoting your recently published blog post, you could easily overlook a solid method. Sometimes, before you think about how to promote the blog, the most important is where to promote. "Google Plus" is the answer to your traffic requirements. Google Plus offers you such platform which is truly trustworthy. Google Plus, which has now grown big with over 300 million active & dedicated users. I have been using Google Plus from last more than 5 years, and I must say marketing your blog on this platform definitely improve traffic to website. Google Plus the most excellent place for driving quality traffic towards the blog and your business website too. Google Plus continuously delivers the more engaged visitors as compared to even Facebook and Twitter. Statistics states that the visitor from Google+ spends more than three minutes on the site which is really worth for reducing the bounce rate and improve page views. Google Plus has always been a preferred by marketing influencers apart from the regular users. The Google+ is truly an ultimate platform where you can find great exposure for your content. So, starts marketing your blogs on Google+ and get maximum traffic flow towards your website. 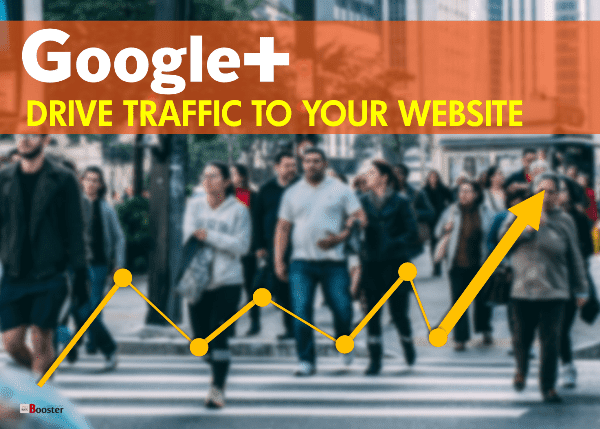 Why is Google Plus a Great Traffic Generation Source? - Know more about SEO G+ and targeted traffic. Here you are going to see how to engage and be engaging to get more traffic from Google Plus. Learn how to use Google+ for promotion and marketing of Blog/website & best strategies for Google+ traffic that not only help to drive massive traffic but increase domain authority fast. 1. Optimize your Google+ business page. In order to get more blog traffic, make your google plus page for business & its information more compatible and valid for Google’s indexing. For this, you can include Meta title and description in your 'About' tab. Meta title or tagline along with the introduction included with 1 or 2 important but targeted keywords really works. You need to add most probably relevant links only in 'About' tab. You can even add website link or any other important online asset related to your business. Google algorithm will crawl your page with the relevant links to show your business listing in SERP. This will help you in the optimization of page information in order to drive more and more traffic from search engine. 2. Add Google+ follow button to your website. Google+ offers two-way traffic. Unlike other social sites and platforms, Google+ offers two-way streets for driving targeted traffic from sharing traffic. You can promote your website or blog by adding links to google plus business page. At the same time, you can gain better results by adding Google+ button on your website. By adding ‘Follow’ and ‘+1’ buttons in various parts of the content, it ensures increased visits and follower rates. By adding these buttons, it increases the chances that Google notices your website because of a large number of sharing has occurred on your pages. G+ provides more exposure to your posts. And Google algorithm started to consider your social sharing factor to calculate your PR and domain authority. 3. Provide importance to the quality content for Google SEO. As I used to say in my most of the pages; "Content is King." It is very important to write quality content. The blog post needs to be interesting, appealing and entertaining. It is very important to be frequent in posting the optimized blogs. And also it is necessary to post several times a week. Be sure that you add relevant targeted keywords in your blog post. It is essential to write new, innovative, and unique content along with quality images posted with the content. The post-images are the first thing mostly seen on the shared links on Google+. This will make you get more blog traffic from Google Plus. Never forget to upload quality visual content that can encourage the people to click, read, share and ultimately follow your blog. 4. Use video for better content marketing. In order to make your post highly valued and of top quality, it is recommended to add selected but engaging "visual content" in the blog post. Put more importance on adding explainer videos on your Google+ profiles, You can even share these images and videos on your brand google plus business page. This helps in increasing the SEO value of your blog content. And in turn, you will get more blog traffic for your blog and ultimately for your business website. 5. Use hashtags and links to broaden your post's reach. In order to get more blog traffic from Google Plus make sure your blog post include relevant links. Be sure to add internal links in the content that can take the visitor to your homepage or any other segment of your website. The internal links help you to improve page-views and so the ad impressions. You can even make use of Hashtags. Hashtags added in the content help in increasing the visibility on Google+. It also helps in targeting the post to the specific audience those have a relevant interest in your products and services. 6. Find, join & stay active on Google+ communities. It is not at all enough to just post your blog links on the Google Plus. It is very important to remain active in Google Plus communities too. The Google+ Communities are the centers around a common theme related to your blog niche like 'Technology' 'Fitness' 'Education', 'Gaming', etc. There are thousands of active communities are available in Google plus with millions of members. By taking an active part in these communities, it helps you strengthen your credibility on Google+. G+ Communities help you build your brand trust. It also helps you expand the reach of your blog posts beyond the network of your followers. Overall, it helps in improved visibility of your blog post on search results. 7. Enable related Google+ page ads in Gmail. Google Widget from Google+ family helps you to highlight the content directly through email messages. With this, you can make your email recipient exposed to your Google+ page. FYI; the Google Widget allows you to send one thousand emails per week. This is really a great opportunity to get more blog traffic from Google Widget and from Google Plus. 8. Sharing your Google+ posts with circles. Google Circles offer numerous possibilities for sharing the blog post to the targeted audience. You can create circles for your customers, partners, team and industry leaders and the people having similar interests. If you want your target audience should read the content, you must share it with targeted ‘customer circle’. To share the content with your industry leaders, you can create another circle namely ‘industry leaders’ and can share your content there. Build circle for each category and even you can also share these circles with other blogger members to drive extra traffic to your G+ page and so the website. 9. Set up Google Authorship. Google Authorship is a process to link all you web content you created with a Google+ profile. In order to drive more blog traffic from Google Plus, you can sign up for "Google Authorship" from authorship page. If someone copies your content to their website and attempts to get credit for it, then Google will know. Use Google authorship to improve SEO & reduce piracy. Setting up Google Authorship for yourself is well deserving the effort for all its advantages. The Google Authorship will help you in influencing the customer online. And in turn, you will get improved blog traffic through Google Plus. 10. Create & host a webinar using Google+ Hangouts. The Google hangout is the most trending method to drive fast traffic to the blog or business website. Hangouts are kind of webinar or video conferences. In order to get the traffic, you can host Google+ hangouts and can then share it on YouTube channel. This will make more and more people watch and come back to your blog post or website. Whenever you have published a new blog post, share or link it to Google+ profile and your business page. This is the most efficient way of getting attention and driving more and more traffic through Google+. You can even also include the 'call to action' and make the people share your content with their friends. This will help you to reach more and more targeted audience and can have greater traffic for your blog post. Getting traffic to the blog post and for the website is very important for improving PageRank, increasing domain authority and so to make money blogging. And for this, it is also necessary to publish the content and the web links on social sites. Well, when to publish and how to publish the content is of great importance. At the same time where you publish or which platform you select for publishing is of immense importance. Google Plus is the most trustworthy platform where you can publish your blog links to promote your content. This is the ultimate platform to get more and quality traffic to your blog and website. Posting your content on Google+ is really a smart choice. It definitely helps you to get quality and targeted traffic for your blog post or business website. Let me know what do you think about Google Plus, if you know any better way to drive audience using G+ pages then let us know via comment section shown below.